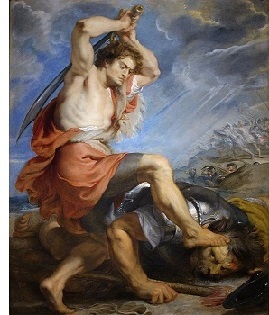 David battles Goliath - After Saul was rejected, the next king arrived on the scene. He was David, son of Jesse. He did not become king right away though (Saul reigned until his death). He did, however, make a powerful impression on the people of Israel as a young man. He accepted the challenge of the Philistines' champion, Goliath. 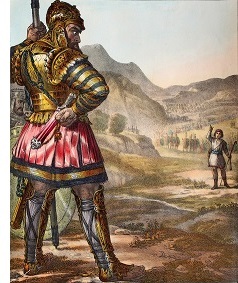 So David went out onto the battlefield and faced Goliath.